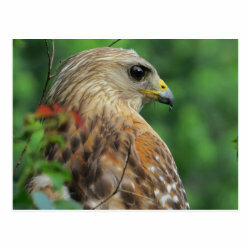 This is a fine intimate portrait of a wild adult Red-shouldered Hawk. At the time the photo was taken, the bird was hunting from a More... perch. Shortly after this image was captured, the hawk took off across a small meadow and captured a frog for a meal. The photo was taken in central Florida, where the Red-shouldered Hawk is our most abundant hawk and diurnal bird of prey.